My love of Nature and patience to wait for optimal light and composition, combine to produce photographs that are often described by others as “paintings.” Visit my modern, home-based studio/gallery to learn how I create archival inkjet fine-art prints on various media including watercolor paper, canvas, and back-light film. See my website for many images. While growing up on a small farm in Wheeling, WV I came to appreciate and love Nature and the outdoors. I learned photography from a friend and a teacher in high school and from several books. While in college I had a darkroom in the basement of my parents’ home, and received honorable mention in Kodak’s national photo contest which provided encouragement. After earning a PhD in graduate school at MIT and teaching and doing research in chemistry for thirty-nine years at Cornell University, I revived my love of photography while traveling to Switzerland with my wife, Kathy. I have mainly focused on subjects I enjoy (flora, fauna, landscapes, sailing, and tennis) and others that stretch my imagination. My works have appeared in many juried shows including Ithaca Artist Markets and the 1996 – 2017 State of the Art Gallery Annual Photography Shows. In the latter a vertical panorama “Lonely Route” won an award in 2004, and “A Glimpse of Peek-A-Boo Trail” (shown) won the People’s Choice Award in 2014. 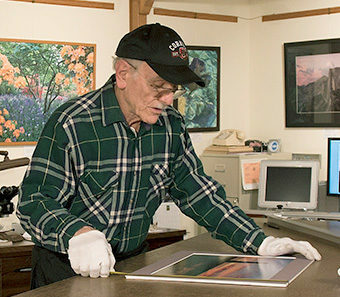 Other awards include “Top Five” in the 2017 Community Arts Partnership’s Group Show, and two firsts in traditional photography at Arts and Wines Festival in Cortland. My works adorn many offices: at Ithaca Family Medicine, at Cayuga Medical Associates, and most recently large works at the Triphammer Marketplace. Works are for sale at Mansour Jewelers, the Cornell Store, and in my home gallery. In addition, I exhibit my fine art photography at a few juried shows every year, including CAP’s Artist Market, Little Red Wagon, and the Maple Festival at Marathon, NY. The studio entry is under the deck on the right side of the house; parking (except for handicapped as marked) is on the left by the garage.